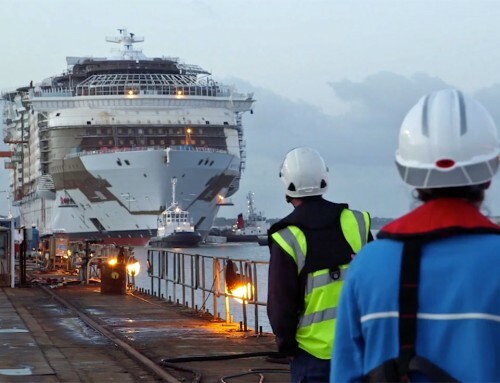 The team of imagineers working alongside the welders and fabricators at the Meyer-Werft shipyard in Germany are proof that when Disney build a cruise ship, they do it differently. Yesterday they disclosed some of the differences that will set their next new ship apart from its supposedly identical twin sister. Disney Fantasy will be launched next March, and follows the introduction of Disney Dream this January. 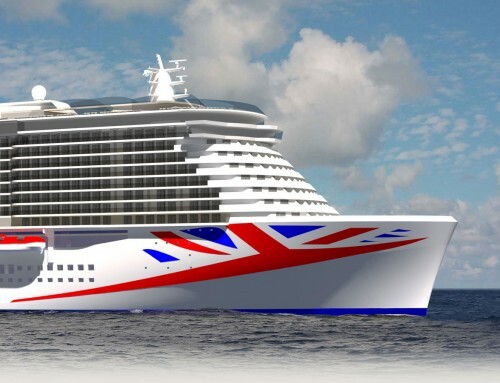 Both carry up to 4,000 passengers; each has a sleek pointed bow and elegant twin funnels. They both feature the AquaDuck, a shipboard water coaster. 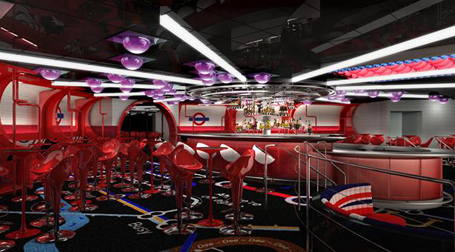 Inside, things are going to be tweaked and changed, especially in the adults-only entertainment district where the main nightclub is to be given a London theme and called The Tube (above). Guests will be advised to “mind the gap” as they walk across a map of the London Underground, and the dance floor will be a giant illuminated Union Jack. The district’s pub is to be given an Irish theme “with modern-day twists. 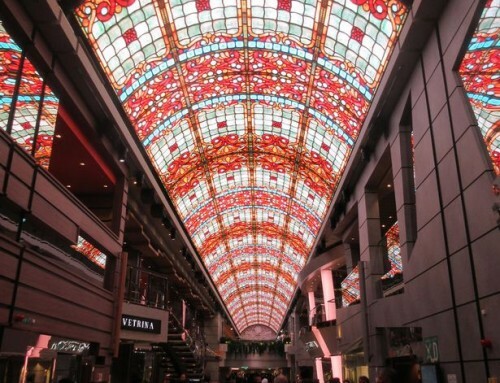 O’Gills will have “dark woods, brass accents and a selection of Irish beers.” It will also have a number of 108-inch plasma TV screens so no-one need miss the live sport action being broadcast to the ship. Elsewhere La Piazza , a bar modelled on a vintage carousel, will have Venetian carnival masks and a Vespa scooter to add authentic Italian flair and the Ooh La La champagne bar (above) will be done out like Disney’s idea of a French boudoir, with velvet tufted walls. In the restaurants, a new dinner show will operate in Animator’s Palate, with Mickey Mouse in his Sorcerer’s Apprentice guise replacing Crush from finding Nemo, who appears on the Dream. Guests will draw their own cartoons on table mats and these will be incorporated in the entertainment which takes place throughout dinner. On stage, a new musical spectacular based on Aladdin is being planned for the main theatre, and in the shops the Bibbidi Bobbidi Boutique will provide children with the opportunity to dress up – and be made up – as princesses or pirates. There’s another 10 months to go before Disney Fantasy sails on her maiden voyage and we can expect lots more features to be announced before then. Those imagineers are going to be kept busy in their German workshops.